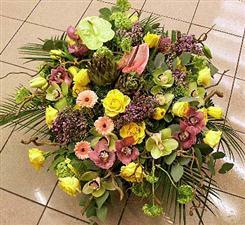 Exclusive flower bouquet with delivery Moscow Russia all cities. Send exclusive flower bouquet. 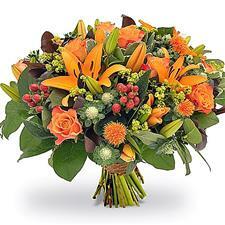 Bouquet "Fiery passion". 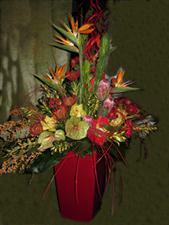 Bright, fiery bouquet will convey your passion. Magnificent composition in a stylish plastic cache-pot. Gorgeous roses heart in basket. Gorgeous roses heart in basket. 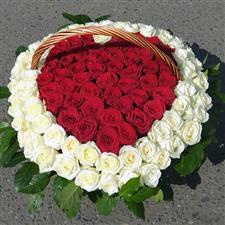 In basket 101 red and white roses. Beautiful flower basket. The basket will appreciate its exceptional beauty the most demanding customer. 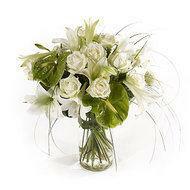 White Lily combined with lush greenery gives floral arrangements French sophistication. In the basket, use a gentle asterisk gypsophilla, roses, ornamental foliage bulbs chrysanthemums. 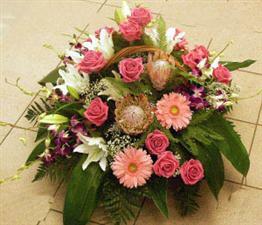 In the basket is composed of lilies, gypsophila, orchids, roses, gerbera, the king Protea, the weight variety of greens. (only in Moscow, Russia, CIS). This floral arrangements no comment. Aerobatics of floristry. Luxury and sophistication combined with professionalism. Orchid, artichokes, majestic Anthurium, lilac, juicy green balls viburnum, bright rose, delicate gerbera, platanoides, robellini, eucalyptus sprigs. This basket will make a splash at a Royal ball. And the choice of flowers will be envied by the Queen on England. Only exquisite flowers. Noble Protea, Callas flowers, velvet rose cultivar "Grand Prix", delicate Lisianthus, molucella, beargrass, air gypsophilla grade "a Million stars", leucodendron, Italian Ruscus and fern. 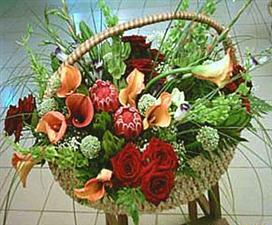 Such a basket to Express your sympathy, to congratulate the head, surprise your partners.